Letters From the Old Country! One of the first amusements to which we treated ourselves was Buffalo Bill's show of the Wild West of America. Some enterprising American presented England with something quite new, and it took like wildfire. 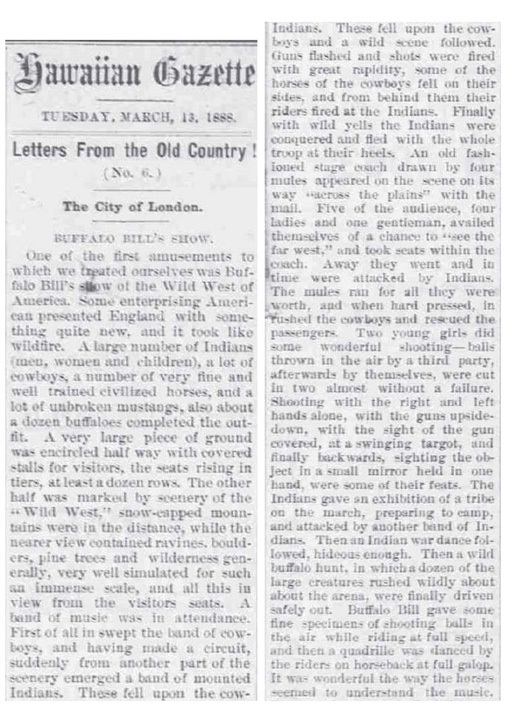 A large number of Indians (men, women and children), a lot of cowboys, a number of very fine and well trained civilized horses, and a lot of unbroken mustangs, also about a dozen buffaloes completed the outfit. A very large piece of ground was encircled half way with covered stalls for visitors, the seats rising in tiers, at least a dozen rows. The other half was marked by scenery of the "Wild West," snow-capped mountains were in the distance, while the nearer view contained ravines, boulders, pine trees and wilderness generally, very well simulated for such an immense scale, and all this in view from the visitors seats. A band of music was in attendance. First of all in swept the band of cowboys, and having made a circuit, suddenly from another part of the scenery emerged a band of mounted Indians. These fell upon the cowboys and a wild scene followed. Guns flashed and shots were fired with great rapidity, some of the horses of the cowboys fell on their sides, and from behind them their riders fired at the Indians. Finally with wild yells the Indians were conquered and fled with the whole troop at their heels. 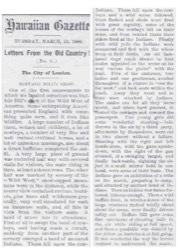 An old fashioned stage coach drawn by four mules appeared on the scene on its way "across the plains" with the mail. Five of the audience, four ladies and one gentleman, availed themselves of a chance to "see the far west," and took seats within the coach. Away they went and in time were attacked by Indians. The mules ran for all they were worth, and when hard pressed, in rushed the cowboys and rescued the passengers. Two young girls did some wonderful shooting—balls thrown in the air by a third party, afterwards by themselves, were cut in two almost without a failure. Shooting with the right and left hands alone, with the guns upside-down, with the sight of the gun covered, at a swinging targot, and finally backwards, sighting the object in a small mirror held in one hand, were some of their feats. The Indians gave an exhibition of a tribe on the march, preparing to camp, and attacked by another band of Indians. Then an Indian war dance followed, hideous enough. Then a wild buffalo hunt, in which a dozen of the large creatures rushed wildly about about the arena, were finally driven safely out. Buffalo Bill gave some fine specimens of shooting balls in the air while riding at full speed, and then a quadrille was danced by the riders on horseback at full galop. It was wonderful the way the horses seemed to understand the music. The most laughable and exciting of all was saddling, mounting and riding unbroken horses and a mule. The wit and sagacity of the animals in frustrating the attempts to mount them was very enjoyable, and their behavior when mounted was terrifying and exciting in the extreme. 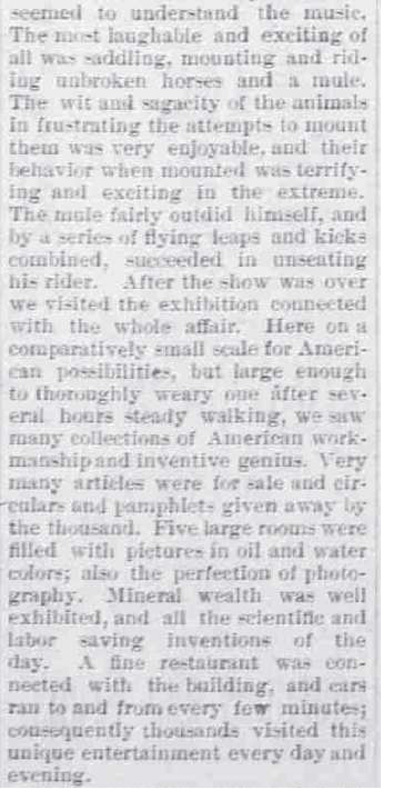 The mule fairly outdid himself, and by a series of flying leaps and kicks combined, succeeded in unseating his rider. After the show was over we visited the exhibition connected with the whole affair. Here on a comparatively small scale for American possibilities, but large enough to thoroughly weary one after several hours steady walking, we saw many collections of American workmanship and inventive genius. Very many articles were for sale and circulars and pamphlets given away by the thousand. Five large rooms were filled with pictures of oil and water colors; also the perfection of photography. Mineral wealth was well exhibited, and all the scientific and labor saving inventions of the day. A fine restaurant was connected with the building, and cars ran to and from every few minutes; consequently thousands visited this unique entertainment every day and evening.